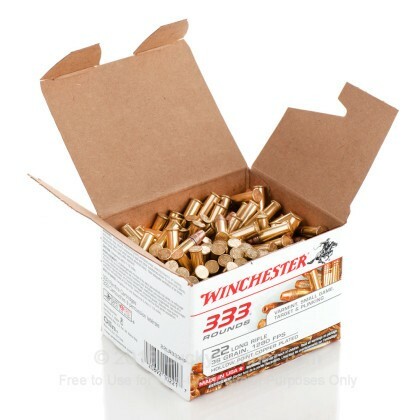 Manufactured by the legendary Winchester Ammunition Company, this product is brand new, brass-cased, and non-corrosive. 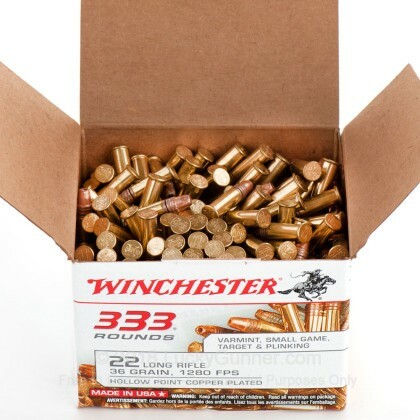 It is a staple hunting, plinking, and target practice ammunition. 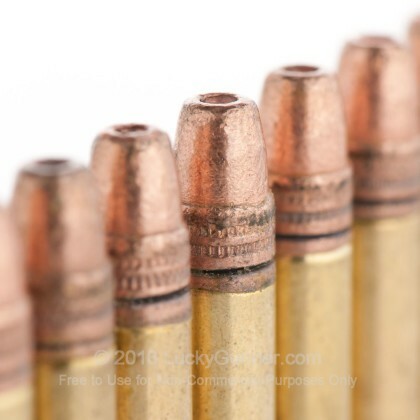 The copper-plated hollow-point bullet is designed for rapid expansion on impact. Even if you do not need a hollow-point bullet, this product is an economical and reliable general use ammunition. Cheap .22 or ammo, but to many duds. From a 4” to my 10/22 carbine this ammo is reliable, accurate and deadly. After function testing I learned these expanded from my pistol and was accurate and deadly in all my .22’s. I got a couple rounds of this . .. 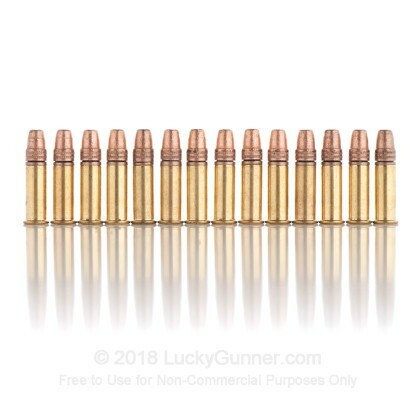 Already said what thought but, would add that Luckygunner is the place to get your ammo always available and ships fast!! Clean your weapon everytime you shoot!!!! I've shot over 1,000 rds. of these 22 -36 grhp Win. 333 rds. In my Ruger MKI & my 10/22 using the Ruger 10/22 BX - 25 X 2 magazine. The only problem I've experienced is that the mag. sometimes fails to load the last bullet into the Chamber. As for the round, no mis-fires, good grouping @ 100 yds. using a 20"barrel. No problem's here & I still have over 3K left. Thanks for the fast shipping & great C/S!!!!! I have been shooting these rounds for a year in my Buckmark and Marlin 22 rifle. There is absolutely nothing wrong with this round, clean your gun and shoot it!!! Comparison of four (x4) 22LR ammunition brands: Winchester bulk pack white box, Armscor, American Eagle, and Remington Bucket of Bullets (Improved Design). 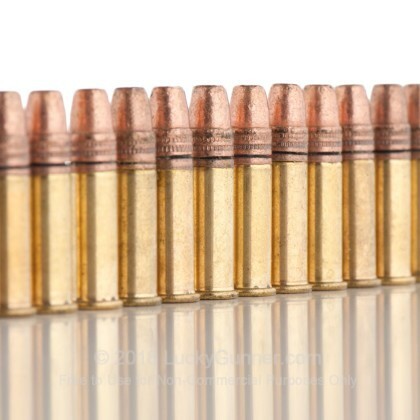 All rounds were labeled as 36-grain, copper washed, high velocity (HV), hollow-point (HP). Platforms used for testing were: Browning BL-22 lever rifle (stock), Ruger SR22 modified with replacement captive guiderod and spring assembly from Galloway Precision. Results of test: The Remington, Armscor, and American Eagle were all roughly equivalent. There were no failures-to-fire and no failures-to-feed of any kind in any platform. Sound levels and perceived recoil were equivalent across all ammunition loads and test platforms. The Winchester ammunition, however, was found to significantly underperform the Armscor, Remington, and American Eagle rounds in all categories. The Winchester rounds were consistently quieter and had significantly less recoil in the SR22 than the other brands. What was worse was that using the Winchester ammunition in the SR22 resulted in a consistent 25 to 40 percent failure to feed rate, across 4 different magazines. Once the rounds were manually fed into the SR22, all fired consistently. 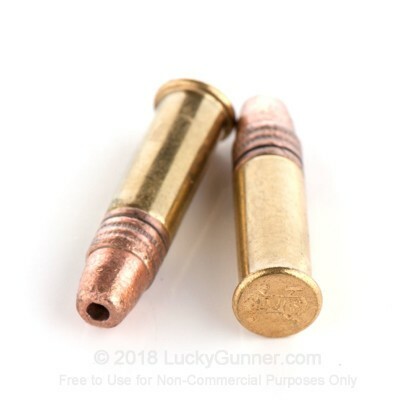 We attribute the high incidence of failure-to-feed behavior with the Winchester ammunition to the fact that the Winchester rounds are significantly under-powered and therefore lacked the sufficient recoil impulse to push the slide back far enough to strip a round from the magazine. 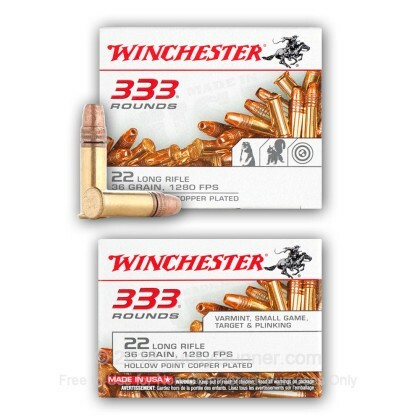 This means that although the Winchester ammunition is labeled as High Velocity, it is NOT HV ammunition. Not Even Close. 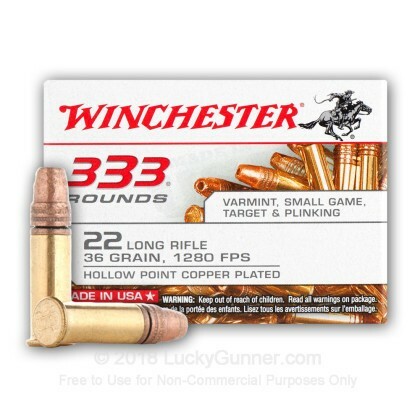 This makes us rate the Winchester ammunition as Not Acceptable and a Do Not Buy recommendation. I've shot one 333 round brick of this ammo through a Ruger MK II target Semi-auto pistol. I shot another 100 rounds through an RPM XL single-shot. Accuracy was acceptable with the Ruger, good with the RPM. However, 3 to 4 rounds per hundred would misfire through the Ruger, a problem I've never had before. I haven't had any misfires through the RPM yet. I like this stuff. Shoots clean and I have had no misfires in the 1/2 of box I've used. 150 or so rounds. used it in three different rifles all with good results. Live in NY so having to go through a transfer agent added to the cost. REPEAL THE STUPID SAFE ACT and give CUOMO the boot!!! I bought 2 boxes and have put about 200 rnds thru my Ruger SR22 with only one FTL. Very consistent performance and a good value. Ordering was easy, shipped quick and delivered quick. I thought with the name Winchester I was buying a quality product. Jams and misfires and now I am stuck with 5000 rounds. Have been using CCI and have had no problems at all. Wish I had read the reviews first. Way too many misfires with the Winchester Ammo for the 22 caliber. This stuff jams constantly. I'd never buy it again. I used it in two different semi-automatic pistols. When I put good CCI rounds in those guns, they operate flawlessly. Buyer beware. I used this stuff in two .22 caliber pistols that work flawlessly with CCI ammo. These Winchester cartridges jam way too much. I'd never buy this product again. Just put 300 rounds through my Henry AR-7 Survival Rifle without a single problem. Every round cycled through the rifle and fired properly. Shipping of the brick via Fed Ex Ground only took a few days. Thanks Lucky Gunner. My Mark II with heavy barrel LOVES this stuff, the best bulk ammo my savage shoots. Runs well through my Buckmark Micro. Loads well through my ultimate clip loader since it has copper rather than paraffin or grease lube. I purchased a box. I have two very reliable rifles that fire any stuff you put into them. They are a CZ 452 and a Henry. Either I got a bad batch or this is the poorest QC I have ever seen. In 200 rounds, I had FTL, FTF and FTE for 25 or so rounds. What I didn't shoot, I gave to the range officer for proper disposal. No misfires and overall good cheap ammo. This ammo is a great price but I've had many bullets that would not fire. At first I thought it was my gun, but after trying a couple of other brands I found it was the ammo. For some reason I get 3-5 from every 50 that won't fire. So I experimented with other brands. The result was zero misfires. So, it had to be the ammo. Some rounds perform better than these, but not at the same price point. 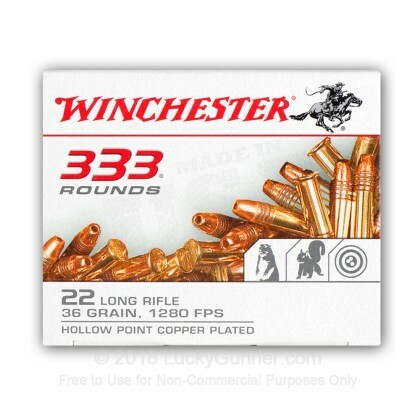 For plinking and small game, these rounds are the way to go! .Great quality for the price. Shoot this out of an mp15-22 and walther p22 and had no problem, not the cleanest but cleaner and more reliable then shooting lead rounds. 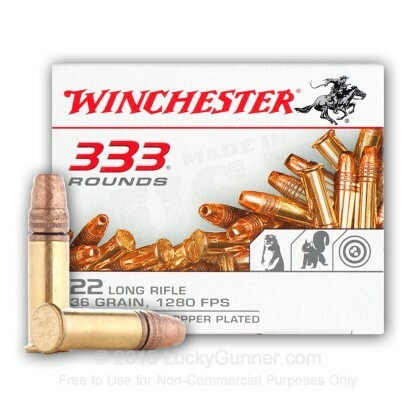 Excellent Winchester ammo, at a price cheaper than the local stores. Great service from Lucky Gunner ! Great affordable Made in the USA ammo !! much better than blazer or remmington (really the only on that must be avoided. Shot well even at 100 yards with my ruger mark II. 2 duds in 555 rounds. Everything was great but the quantity is not good. Still shoots perfect making the extra cash out worth it. No problems good stuff priced right...recommend you try it awesome product. This is a great deal for those of us who love to plink. A great price, and only 2 out of the 333 rounds jammed -- I would say it was because my sons didn't clear the casing properly out of the lever action we used it on. Time to get more! No problems! Great Price! Great Value!!! This stuff wouldn't feed in my 10/22 because the hollow points were too big. Its more expensive than the federal stuff but doesn't feed well. Lot's of FTE's and failure to chamber the next round in my walther p22. A: Hi William. The ballistic range of this cartridge is heavily dependent upon the length of the barrel of the firearm used. You can find your own customer ballistics charts for your specific load, barrel length, even altitude here: http://www.jbmballistics.com/ballistics/calculators/calculators.shtml I use this for my handloads and have found it to be a most excellent resource. 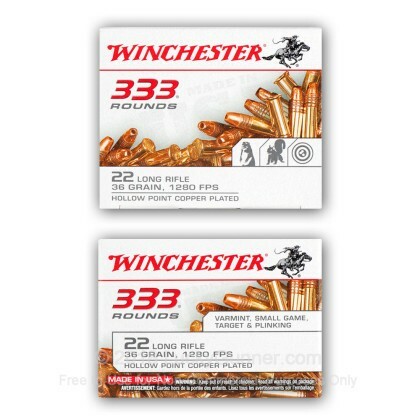 We also have this 22 LR - 36 gr CPHP - Winchester - 3,330 Rounds ammo in stock in a bigger quantity.